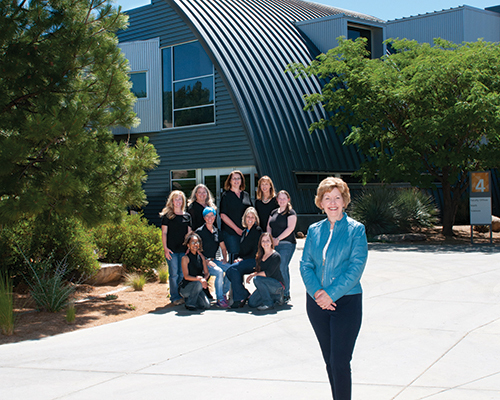 As a longtime educator, Dr. Wills believes her final assignment—as President of Yavapai College—is a wonderful capstone to her career (she’s set to retire in December). Personally and professionally, her seven years at Yavapai College have given her the opportunity to carry out what she believes is her responsibility: to make the society she lives in more vibrant. If the comments of some of her faculty and staff members are any indication, she’s succeeded. “She’s been wonderful for Yavapai College,” said Nursing Professor Dr. Selina Bliss, adding that Dr. Wills is very invested in the learners, the students, and Yavapai College,” and that she’s brought faculty and administration together and set a positive tone. Tania Sheldahl, the college’s Associate Vice President and Dean of Student Services, echoed that sentiment. “She’s a great president,” she said. And Ustadza White, Library Manager of Technical Services and Technology, said Dr. Wills sincerely cares about students, and not only exhibits a passion to ensure they have what they need to succeed, but also wants to make them feel heard and valued. That’s exactly what Dr. Wills has aimed to do. As she ended a seven-year term at Northeast Iowa Community College, she saw that Yavapai College was looking for a president. The more she learned about it, she said, the clearer it became that this “complex” school was the best institution she could have discovered. In addition to a solid academic program, Yavapai College offers performing and visual arts, the Osher Lifelong Learning Institute, science labs where undergrad research takes place, and nationally acclaimed Southwest Wine Center. The sports teams are nationally ranked, and the nursing program is one of the top in the country, and the career and technical offerings are among the most comprehensive in the state, such as Unmanned Aircraft Systems (UAS), Computer Numerical Controlled (CNC) Machining, Electronics Technology, and Viticulture/Enology. There are special offerings for people who earned their GEDs, and for English Language Learners. Plus, the college is home to many special clubs and organizations, including “I am Yavapai College,” a student organization that raises money to help students experiencing emergencies. “It’s fabulous,” Dr. Wills said. Many of the students are first-generation college attendees, and many of them work several jobs, have children and families, or are veterans. They’re doing so much, and yet they still consider education so important that they enroll. “The best thing we can give them is confidence,” she said. To that end, she hopes that she and her team—the faculty and staff—leave a legacy of working as a team to create an environment where everyone has a voice. That environment extends past the college’s campuses to the communities it serves. Dr. Wills plans to retire in December, but until then, she has her work cut out for her. During the next several months, she plans to support her faculty and staff in refining the Pathways program, which streamlines and organizes the process of students planning their courses and careers. She also plans to continue her work with the shared governance committee and regional economic development (as the school’s technical education department expands partnerships with local companies). As the school celebrates its 50th anniversary this fall, it will host the weeklong Post-Secondary International Conference in September. Dr. Wills will help with the search for a new president, as requested by the Yavapai College Governing Board. Although neither of them attended college—her father joined the military and her mother was valedictorian of her high school class—they encouraged Dr. Wills and her sister to do so. At the time Dr. Wills graduated from her Catholic high school—in the seventies—she wanted to become an astronaut. But she didn’t meet the perfect vision requirement. That left her with three options, she said: to become a nurse, a nun, or a teacher. Being a nun was out; Dr. Wills had a boyfriend at the time. Although her sister was a good nurse, Dr. Wills fainted at the sight of blood. So she attended the University of Cincinnati and earned her bachelors degree in Education. While she was in school, she saved her electives until senior year so she had time to be very active in student engagement and student development. She enjoyed it tremendously. After three terms of student teaching, she realized she still had a passion for education—but not necessarily at the elementary level. Thinking back to how much she’d liked student development, she went back to school and earned her masters degree in Counseling from Miami University in Ohio, and then her Ph.D. in Higher Education from Michigan State. She found her stride in the Student Development element of higher education; specifically, in guiding and supporting students as they are exposed and reacting to new ideas, where they’re forming their own opinions, and really figuring out who they are. Now, four decades later, she’s moving on.